Q: Which trip can be cancelled via My Trips? Deleting the trip will remove the booked items from the itinerary view, however, bookings will remain valid. Note this is only possible via the mobile app. Once deleting the item/trip, it will not be visible in the web view. You can cancel hotel items only via “My Trips”. 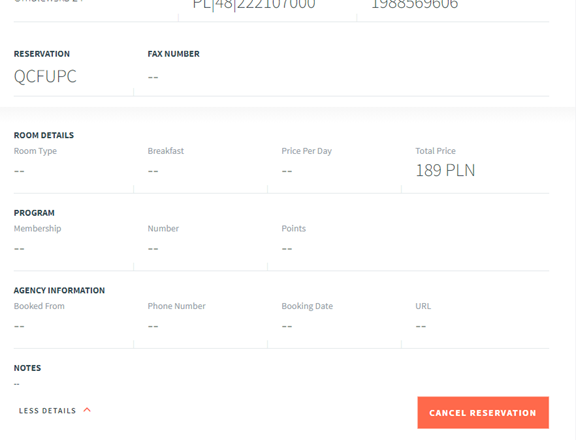 All other items: car, rail and air should be cancelled in the same manner they were booked as a cancellation button will not be displayed within the trip. The hotel booking was done offline either by a CWT travel counselor or via an OBT and a PNR was created. In this case, we suggest cancelling the booking either by phone with a CWT travel counselor or through the OBT. When the trip had already been cancelled on another platform and was not removed from Itinerary view. This may occur due to a synchronization issue in which case trip may be removed in the next synchronization automatically. If the trip still appears 24 hours later, please contact your respective CWT technical assistance team. Q: How long after cancellation of the trip is it still visible under “My Trips”? A: The cancellation should take place in a matter of moments, however, if 24 hours later the trip still appears, it is recommended to cancel again. Q: I have several upcoming trips already booked, however I cannot see them. A: Trips that were booked directly through myCWT should appear in the itinerary right away. If you have booked a trip and it does not appear within the itinerary, this may occur only when booking offline either via a CWT travel agent or using an OBT. Along booking through that channel, connection issues may occur which will prevent the PNR from being sent to our server and will result in not displaying the trip in the itinerary. Before making another booking, please refresh the page and wait a few minutes. If you receive an email itinerary confirmation, the first booking was successful. Q: Is there a difference between PNR cancellation and Email confirmations that are sent to plans@mycwt.com ? A: As opposed to PNR generated trips, email confirmations that are sent to plans@mycwt.com cannot be cancelled as most email formats do not contain enough data for our servers to understand there was a cancellation. If the trip combines both PNRs and email confirmations, deleting the trip would not suffice as the PNR generated bookings will still be valid. Before deleting the trip manually, it is necessary to cancel the PNR generated items in the same way they were booked, whether it is through the application or offline via CWT travel counselor or OBT. Q: In which scenario will the cancelled trip still be visible under “My Trips”? A: A cancelled trip should not be displayed within “My Trips”. In the event that it does, it may occur due to a synchronization issue between databases that caused the cancellation to fall through, therefor trip still appears in the itinerary. In this case we suggest trying to cancel again or contact your respective CWT technical assistance team. Q: How can I be sure that the booking via Hotel Express was actually made if I have not received the email confirmation? A: If a booking had been made, however a confirmation email was not received and the trip is not displayed within “My Trips”, the booking may have not been completed. This could be due to synchronization issues. in the event this scenario should occur, please contact your respective CWT technical assistance team. Please note that if another booking attempt had been made within the same hotel booking flow, an error message will be displayed explaining a booking had already been made. Q: How do I cancel a trip via “My Trips”? Go into “My Trips” and choose the trip you wish to cancel. Click on the hotel item, then on “More details” to open the card. 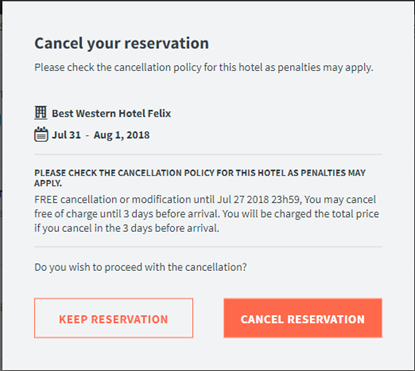 Click on the bottom right on “Cancel reservation”. You will be asked to check your cancellation policy before cancelling entirely.